At the heart of DUNE 3 are its powerful oscillator blocks. DUNE 3 supports VA, FM and Wavetable synthesis. With a maximum reserve of 8320 oscillators at full polyphony, DUNE 3 is a true unison monster, unlikely to ever run out of oscillators. New in DUNE 3 is the "Swarm" mode, an evolution of the classic Supersaw oscillator. 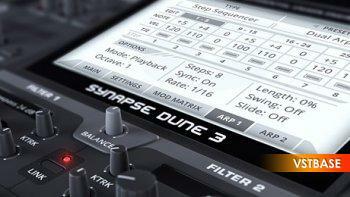 DUNE 3 offers many new effect algorithms in all categories like Distortion, Chorus, Phaser, EQ, Delay and Reverb. One of the most important additions is the new Equalizer, which sports technology from our GQ-7 Graphic Equalizer rack extension. Improved compatibility with Reason 10 and Bitwig 2.5 beta.